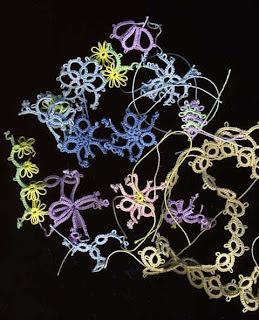 I am looking forward to the 11th Annual International Tatting Seminar in Hector, NY, sponsored by the Finger Lakes Tatting Group under the leadership of Karey Solomon. Classes will be Saturday and Sunday April 18-19, and on the Friday before, there will be tea and snacks at Karey's shop in the afternoon and an informal bring-a-dish supper at the Firehall in the evening. This Maltese Teapot is the project for the class I will be teaching. It begins with the Maltese ring in the middle, and then it's downhill from there, with just ring and chain in the outer rounds. The cup pattern is provided as well, should anyone want additional practice with the Maltese ring in a smaller piece. The cup does have split rings. I teach the Maltese ring using the modern method rather than the Riego version. When I figured out how to make the ring that way, I thought I had made a revolutionary new discovery, but then I learned that method had been discovered before and was already in use by the Shuttle Brothers, Mark, and others. 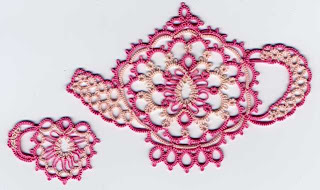 For the class, you will need 2 shuttles and 2 colors of thread. I told Karey that I recommended size 20 or size 30 thread since I find those sizes easy to work with and big enough to see what you are doing. But if size 10, or 40, or perle cotton is your favorite size, I am sure that will be OK. It is important to use good quality thread. Maltese rings can be difficult to close since they have a lot of stitches. If the thread is not smooth enough to slide well, it may break when you close the ring. But what to call it? 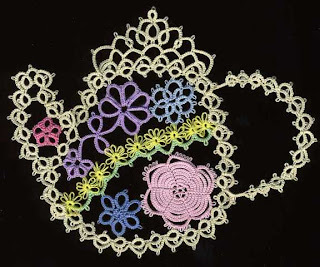 Crazy quilt teapot? Flowers of Spring? I'm not so good at coming up with names. I claim this as the final entry in my second pass at the Twenty-five Motif Challenge, though I am months behind my year's deadline. After a bit, I expect to start up again.